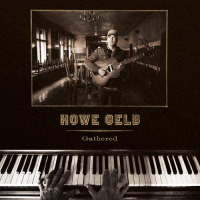 Singer/songwriter Howe Gelb has made his name with desert-rock/alt-country pioneers, Giant Sand, but he also has a lengthy solo-career, and his 24th album, Gathered, finds him in his usual excellent form. The album follows a flirtation with jazz that came to the fore on the superb Future Standards (Fire Records, 2016) and the follow-up Further Standards (Fire Records, 2017). Those albums were very much carried by Gelb's skewed piano playing, equally old-fashioned and hip, swinging in his own minimalistic style and launching himself as a late-night lounge-jazz balladeer, with the perhaps semi-ironic ambition of writing a batch of new standards. Gathered builds on the lessons learned from playing his own standards, but also takes in other aspects of Gelb's past. There's a cover of a song penned by the late Rainer Ptacek, whom Gelb played with in Giant Sandworms, a precursor of Giant Sand. Gelb's version of "Storyteller" actually says something about his approach as he sings: "I'm no storyteller / I never claimed to be." Of course, this is the beginning of a story played as a piano ballad. Gelb is the quintessential storyteller as anti-storyteller, or perhaps it's just that he finds the detours more interesting than the main plot. "The Park At Dark" is a good example of a story without a real ending. Someone runs away and what happens next? The story never tells, Gelb just sings: "Lauren where have you gone?" Gelb's songs also go astray. They are often like poetic sketches, anecdotal with an unfinished, homespun quality about them and yet they shine like little diamonds, whether it is the jazzy "My Little World," complete with brushes and walking bass, or the piano balladry of "Presumptuous" where his deep voice duets with Kira Skov. Speaking of a deep voice, Gelb has been compared to Leonard Cohen, and he delivers a convincingly tangofied reading of Cohen's "A Thousand Kisses Deep" with singer M. Ward, adding strings and Spanish guitars. There is something earthy and charmingly informal about his approach to Cohen and the same thing goes with the great Mancini-Mercer-standard "Moon River" that is sung by Gelb's daughter Talula. Together they get directly to the poetry of the song without any pretension. While Gathered may be a hodgepodge of sounds, songs and impressions, it's also a distinctive and coherent collection of compositions from a musical auteur, who is still playing, collaborating and finding his way in the world. Track Listing: On The Fence; A Thousand Kisses Deep; Not The End Of The World; Anna; Give It Up; The Open Road; Flyin' Off The Rails; Gathered; All You Need To Know; The Park At Dark; My Little World; Presumptuous; Storyteller; Steadfeast. Personnel: Howe Gelb: vocals, piano, electric piano, guitar, fuzz guitar, pump organ, string machine; The Lost Brothers: acoustic guitar, harmony vocals; M. Ward: vocals; Thøger Lund: upright bass; Brian Lopez: Spanish guitar; Juan Panki: Spanish guitar; Gabriel Sullivan: percussion; Fernando Vacas: shaker; Alix Mérckx: upright bass; Paul Jothy: drums; Anna Karina: vocal; Stéphane Belmondo: trumpet; JB Meijers: drum programming, bass, guitar; Tommy Larkins: drums; Andrew Collberg: drums; Talula Gelb: vocals; Gabriel Naim Amor: guitar; Christian Blunda: electric guitar; Pieta Brown: backing vocals; Kira Skov: vocals.